February 2nd is Groundhog Day! Learn about this unique holiday with our printable worksheets and reading comprehension passages. This basic word search is designed for students in grades 1 and 2. Words are only hidden across and down. There are no diagonal or backwards words. Puzzle includes the words hold, Phil, winter, spring, and weather. This intermediate word search has words hidden across, down, and diagonally. Kids can search for the words underground, Punxsutawney, Pennsylvania, and hibernate. Cut out the letters in the word GROUNDHOG and rearrange them to make new words. This activity includes primary-ruled lines for students in kindergarten through second grade. Cut out the letters in the word GROUNDHOG and rearrange them to make 3, 4, and 5-letter words. This activity includes a scoring system and is designed for intermediate students in 3rd through 6th grade. Kids can color and assemble this cute crown. It has a picture of a groundhog and says, "Spring in coming!" This groundhog crown says, "6 more weeks of winter!" Kids can color the crown and wear it home! This crown simply says, "Happy Groundhog's Day." Kids can color it in, cut it out, assemble it with glue, and then wear it around the school. For best results, you'll want to print this on tagboard. 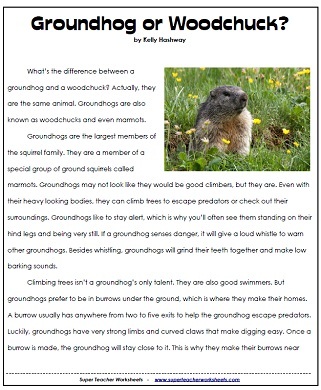 This basic article teaches kids about groundhog burrows, hibernation, and habitats. Includes comprehension questions, a vocabulary matching activity, and a writing prompt. What's the difference between a groundhog, woodchuck, and a marmot? Find out by reading this article. Includes reading comprehension questions and a vocabulary game. On Groundhog's Special Day, he'll climb out of his burrow to look for his shadow. This cute poem is a fun way to explain the holiday to kids. What makes Phil a most unusual groundhog? His ability to predict the weather! Students cut out the words and rearrange them to make a complete sentence. The sentence reads, "The groundhog saw its shadow." Students cut out the words and rearrange them to make a complete sentence. The sentence reads, "The groundhog did not see its shadow." How many errors can students find in this paragraph about Phil, the Weather Forecaster? Use standard proofreading symbols to correct the mistakes. Why is Punxsutawney Phil driving a car? Write a story to explain the picture. Write the sum of each pair of numbers. Then color according to the key at the bottom. The finished picture shows a groundhog emerging from his hole. 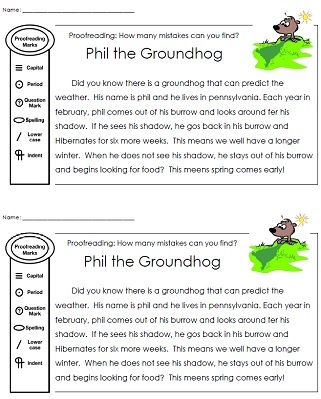 This 3-digit addition worksheet features pictures of groundhogs and groundhog word problems. First write the answers to the basic subtraction facts. Then color each section of the picture according to the key at the bottom. The finish picture shows a groundhog popping out of his burrow in springtime. Count the dots in each section of the picture. Then color according to the key at the bottom of the page. The final picture shows a springtime scene with a groundhog coming out from his burrow. Color the picture of a woodchuck as he emerges from his hole after a long winter's nap. 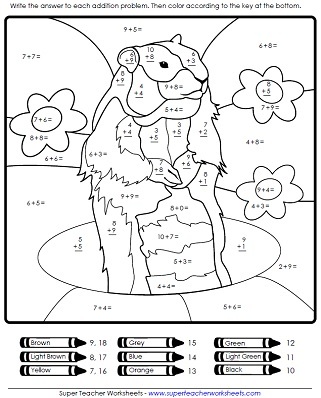 This is a very simple color-by-number worksheet. Print spring word search puzzles, math worksheets, calendars, and reading comprehension passages. We have dozens of Valentine's Day puzzles, poems, and worksheets. Print word searches, articles, and math worksheets for Presidents' Day.